In order to develop the finesse of Real Estate Salesmanship you need to develop a better relationship with the Questions you ask of your clients. In fact the first questions you ask new potential clients must lead to building a relationship, and getting to know them; Not a series of Yes and No Questions that feel like an interrogation. Take the example of a meeting a Seller for the first time, you may inquire about where they plan to move to once they sell their House. 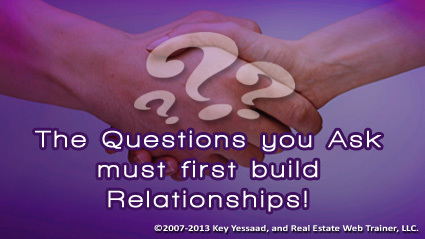 This type of question has two ingredients that help build a relationship; it is a positive question because you are affirming that their house will sell, and second you are asking about their lifestyle with an open ended question. The same process is true when designing squeeze pages (forms) in your website; the first questions you ask should never be about their contact information such as name, phone number and email – focus on multiple choice answers that have built-in to them positive messages. An example would be: Have you thought of owning your home? and the choices would be: ‘Yes, I can’t wait’; ‘Not sure, Need to Learn more’; ‘No, Not sure how to get started.’ Instead of a Yes/No that reveals nothing and build no relationship you are offering a way to share a little of themselves, and you are also giving them an out: ‘No Sure’ is an out: it is an opening that leads to a conversation – the first step towards a successful Sale.